RADOME RELOCATABLE RING WALLS | Infinite Technologies, Inc.
ITI has developed solutions for rapid assembly relocatable ring walls. The structure consists of standard steel shapes and a composite filler panel situated between the structural members. The ring walls are configured to support our sandwich wall radomes in areas subject to wind loads up to 190 mph [305km/h]. The steel portion of the ring wall is finished with a durable powder coat finish with a wide variety of color options adhering to FED-STD-595 or RAL colors. 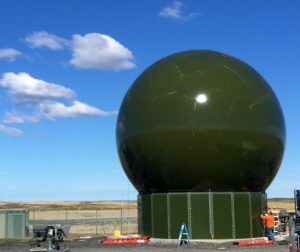 The fiberglass filler panels are also finished with a durable gel-coat finish which provides excellent color match options between the radome and the relocatable wall. Wall geometry consists of faceted segments constructed from MC channel and W beams which are bolted together at the factory. The wall segments are secured to the foundation by means of anchor bolts embedded into a flat concrete foundation. The wall is a modular, transportable structure allowing it to be disassembled for transportation and erection in a new location simply by unbolting the segments, thus alleviating the need for additional civil or structural requirements. A personnel door can be incorporated into the ring wall assembly by means of a special panel that replaces a standard wall segment, it is a direct bolt-in item that does not require modification and is flush with the top of the concrete mounting surface.